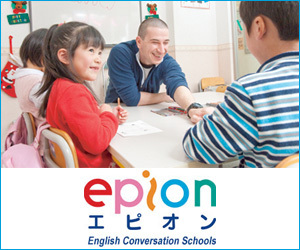 Epion is part of the extensive Mabuchi Education Group of preparatory schools in Japan. The Mabuchi Education Group is a large chain of ‘jukus’ in Japan. A juku is a type of Japanese ‘cram school’ where students can take classes beyond regular school requirements. Many students attend jukus in Japan, usually starting from some point in elementary school and continuing through junior high and high school. They attend these schools to study various subjects, increase their knowledge, and improve their scores on Japan’s rigorous junior high school, high school, and college entrance exams. Epion is primarily an introductory English school for children ranging from pre-schoolers to teenagers. Most of the kids who take classes at Epion eventually go on to join the Mabuchi juku. Epion currently has 2,500 students and maintains seventeen schools in the Kansai area of Japan. We’ve also been expanding steadily and will continue this progress in the future. Please see our Schools page for more information on our locations. There are currently thirty-five foreign staff members working as teachers and managers at our schools. Epion’s teachers come from a wide variety of backgrounds and countries. Collectively, we’re an enthusiastic, forward-thinking group of people who enjoy living in and experiencing Japan, and we’re constantly striving to become the best teachers that we can be. Epion’s materials and teaching tools have all been created in-house, by our own teachers and staff members, including curriculum development, homework, audio CDs and tests, not to mention recruitment webpages and more! We’ve even developed and released three computer CD-ROM video games named FunPlex, designed to entertain as well as assist in language practice of our course requirements. The three stages of Funplex are graduated in level of difficulty, thereby allowing kids of varying ages to enjoy the games, and designed to challenge. For reference, you can find our website from the links below. At Epion we offer a comfortable work environment, competitive salary, extensive benefits and an academic focused curriculum. We hope you will become a part of our colorful, spirited team. Epion offers a comfortable working atmosphere. All teachers and staff members know one another. We work together as a team, and socialize together as friends. Our culture of learning is one of the rewarding aspects of working here. Since the majority of Epion’s students are children. Epion offers a wide array of benefits to its teaching staff. Click on the links below to read more about our extensive benefits. Epion offers six different courses that provide a track for the development of English in a wide variety of students, from very young children to adults. Click on each course to see more information.